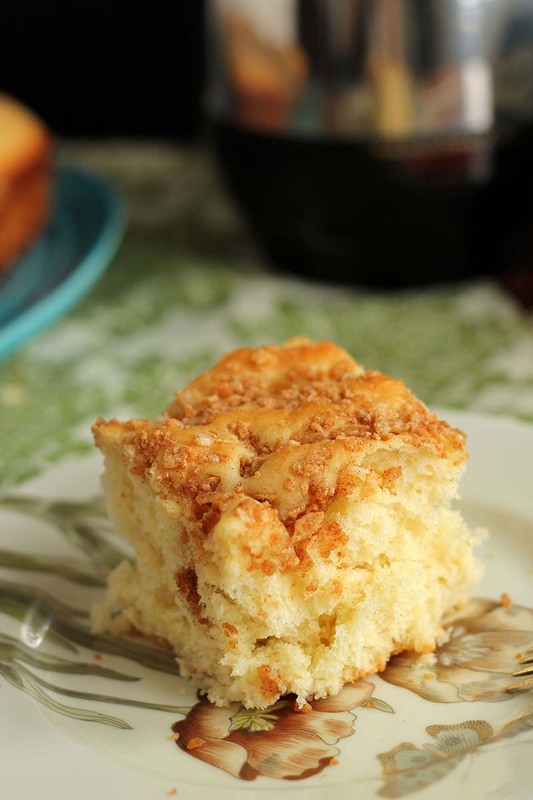 A slightly sweet no knead coffee cake studded with a cinnamon-crunch topping. Measure the sugar, salt, flour and shortening into a bowl; blend. Set aside. Pour the water into a mixing bowl; add the yeast. Stir; let stand 3 to 5 minutes. Add the eggs, vanilla, and ½ the flour-mixture. Beat 2 minutes with electric mixer on medium speed, or by hand until smooth. Stop mixer. Add the remaining flour mixture and beat again with a spoon until smooth, about 1 to 1½ minutes. Scrape down batter from sides of bowl. Cover. Let rise in warm place until doubled, about 30 minutes. Meanwhile, prepare topping: combine topping ingredients in bowl. Set aside. Grease one 9 x 13 x 2-inch pan, OR two 8- or 9-inch square pans. Beat down raised batter with spoon in about 25 strokes. This is a thick, somewhat sticky batter; spread evenly in the pan(s). Sprinkle topping evenly over batter. With fingers, make dents on topping, pressing down almost to bottom of the pan. Tap pan(s) on table to settle the batter. Let rise until doubled, about 20 to 30 minutes. Preheat oven to 375°F. Bake 20 to 30 minutes. Remove from pan(s) and cool on rack. Recipe featured at Stephie Cooks.